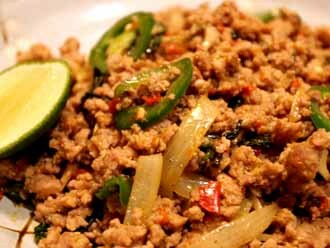 Marinate the ground pork well with tapioca flour and a some oil to keep it moist. In a wok, heat oil. Add garlic and stir fry until brown. Add in basil leaves, onion, and jalapeno pepper to mix, about 1 minute. Best eaten with fresh steamed jasmine rice.